Slow Cooker Roasted Chicken from Local Kitchen turns out gorgeous roast chicken cooked in the slow cooker! And your kitchen will stay cool! For Friday Favorites we spotlight past recipes that you may have missed, and Slow Cooker Roasted Chicken is a brilliant idea when you don’t want to use the oven! 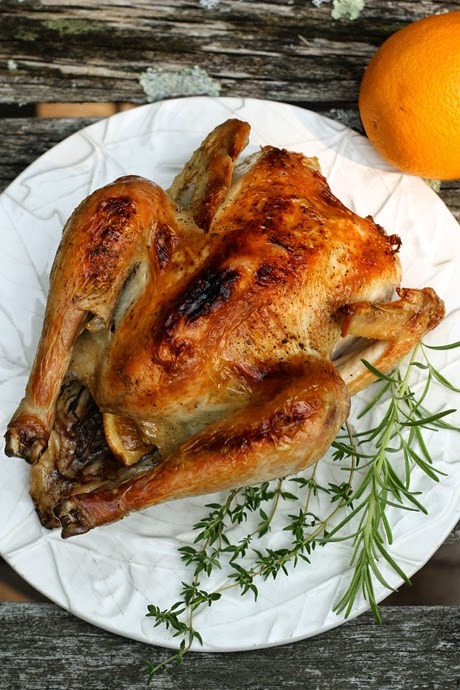 Roasted chicken is something that tastes great any time of year, and it’s also a good starting to point for creating dishes from leftovers. This recipe for Slow Cooker Roasted Chicken from Local Kitchen will walk you through the steps for amazing roast chicken cooked in the slow cooker. If you want that beautiful browned skin like you see in the photo, Kaela says a few minutes under the broiler will finish the chicken off perfectly! Get the complete recipe for Slow Cooker Roasted Chicken from Local Kitchen. Use the Index Page for Chicken to see all the slow cooker and pressure cooker chicken recipes that have been featured on this site. The first slow cooker I bought was a 4-quart oval, because it was large enough to cook a whole chicken. But I've yet to do that (two years later!). This recipe inspires me. Lydia, I haven't ever done it either and this is the first recipe that made me realize that I must try it myself as well! This looks delicious Kalyn! I'd love for you to link this up at our link party happening now at Bakerette.com and show off your amazing talent! Jen, it's not my recipe so I don't think it would be fair for me to link it in a party. But glad you like it.